The Government has a duty to ensure that legislation is passed as soon as possible to ensure the timely provision of abortion services and stop even more pregnant people having to travel. The Abortion Rights Campaign welcomes the passage of the Health (Regulation of Termination of Pregnancy) Bill in the Dáil. While we remain troubled at numerous provisions contained within the Bill, this is a momentous step towards achieving abortion rights in Ireland. She continued “Doctors can and must provide healthcare for their patients. We know there are many pro-choice, patient-centred doctors who are ready and willing to give pregnant people the healthcare they need. We, as activists, have spent years fighting for accessible, accountable and evidence-based legislation to provide abortion care. 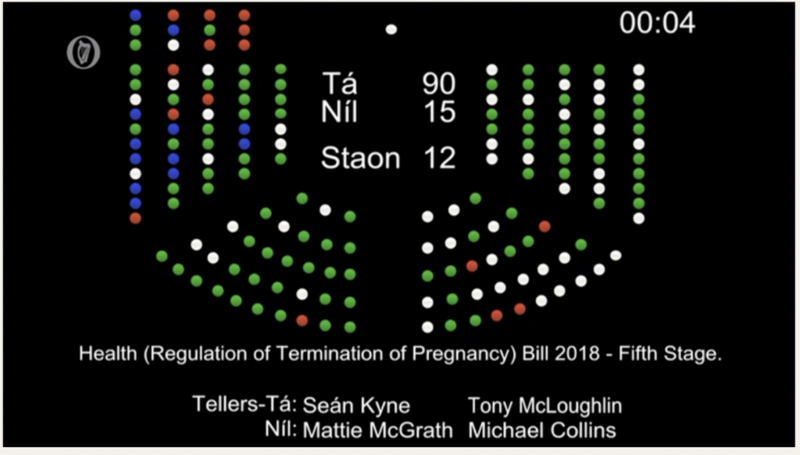 We are extremely disappointed to see that so many valid improvements to the legislation were voted down, on shaky grounds, to the detriment of pregnant people across Ireland. We have steadfastly highlighted the problems with the legislation throughout this process. We will continue to fight for access to free, safe, legal and local abortion services for all those who need it on the island of Ireland. We urge members of the public, especially those on the Seanad electoral register, to contact their Senators in advance of tomorrow’s final debate. It is very good to pass the law. But it also important that the law is upheld and put into practice. In South Africa early termination of pregnancy is legal, unfortunately it is very difficult to get. Health practitioners make it very difficult for pregnant women to get a safe abortion. Pregnant women are ridiculed or they keep on postponing the date of the abortion until it becomes illegal to do it and then the poor woman is sent away. The result of this has been that women become desperate and perform unsafe abortion. It is therefore critical to have the law in place but also the health practitioners must be willing to help pregnant women.